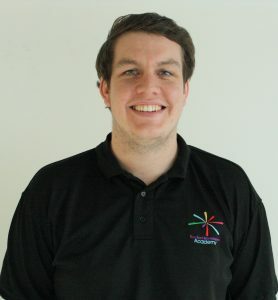 In this contributed blog post, Scott Langshaw, IT manager at the East Manchester Academy explains the importance of enabling students through the use of technology. The use of tablets in schools has soared in recent years and the explosion in educational apps shows no sign of slowing down. Mobile technology is opening up so many new possibilities for teachers and students that it is nothing short of a revolution. But if the wireless network is not capable of supporting a burgeoning number of tablets, a school could find itself plunging back into the dark ages. Here at The East Manchester Academy, we wanted our students to benefit from mobile technology, but in common with so many schools, our wireless solution no longer had the capacity to support the great work that was happening in our classrooms. If you’ve ever had to stand up in front of a bunch of 13-year-olds and explain that they can’t get hold of the material they need for their geography project because the wireless network is down, you will understand the problem. Likewise, when a teacher tries to get 30 students to complete a quiz on their devices, but the wireless connection grinds to a halt and the quiz doesn’t update, then nobody learns anything. Rather than helping, our old technology was preventing lessons from progressing smoothly. The time had come to upgrade our IT infrastructure. However, we are a school and though our dreams may be big, our IT budgets come only in small sizes. We needed solutions that would help us engage our kids, but they had to meet our budget. As it turned out, the solution was more affordable than we had expected, and I have been particularly impressed by the capability of the wireless solution. Our IT partner, Capita Managed IT Solutions, helped us to tailor a new solution exactly to our needs. It’s been fascinating to see what a difference it makes to have a reliable wireless solution around the school. The big change is that our classrooms are always connected, whether students are using tablets, laptops or a combination of both. I would go so far as to say that our Wi-Fi meets the expectations of the most impatient teenager. Students can log into the system instantly and everything they need for the school day is all in one place. Working together is the best way to engage students and help them learn, and this is one area where mobile technology really comes into its own. Our students are accessing the content they need straight onto their tablets so they can share and edit their work together. Teachers connect their tablets to the whiteboards in the classroom for a class discussion, and when it comes to marking work, teachers send instant feedback with a few taps of the screen. The tablet revolution has taken off in our academy, and the students are benefitting from lessons which are engaging and enjoyable. It is reassuring to know that despite our limited budget, we have built the foundations for great teaching and learning both now and in the future. 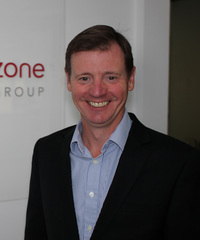 This is a guest post by Steve Gandy, CEO at MeetingZone. Reading, and Bracknell, hotly followed by Oxford (near MeetingZone HQ) and Edinburgh, are officially the best cities to live and work in the UK – according to the Good Growth for Cities Index published by PwC and think tank Demos recently. It ranked UK cities against 10 criteria including employment, health, income and skills, housing affordability, commuting times and environmental factors. It follows similar research last year from PwC that ranked London (over Berlin, Stockholm, Paris and New York) as one of the best cities of “Opportunity”, in a report which examined intellectual capital and innovation; culture, technology readiness and how accessible a city is to the rest of the world. So what does this say? Well our growing interest in such surveys shows how we’re all – employees, HR and management – much more focused on well-being and work-life balance. And that’s a good thing. But for me, external factors like location are just part of the equation. The ‘best’ place to work shouldn’t just be about where your office is based, but also about the company you work for – so for example how does management operate and what culture does it creates for employees. Today’s companies rightly scour over all sorts of indicators of work life balance including employees leaving, employee satisfaction surveys and hours worked. But what often gets forgotten by management is the impact of technology in creating that sense of well-being, which in turn can lead to content and productive employees. Again, PwC provides insight here. It conducted extensive research earlier this year into attitudes amongst 400 SME’s ranging from 10 – 1000 employees about deploying Unified Communications (UC). UC brings together a huge range of services, from email to web conferencing and telecoms to sharing data. 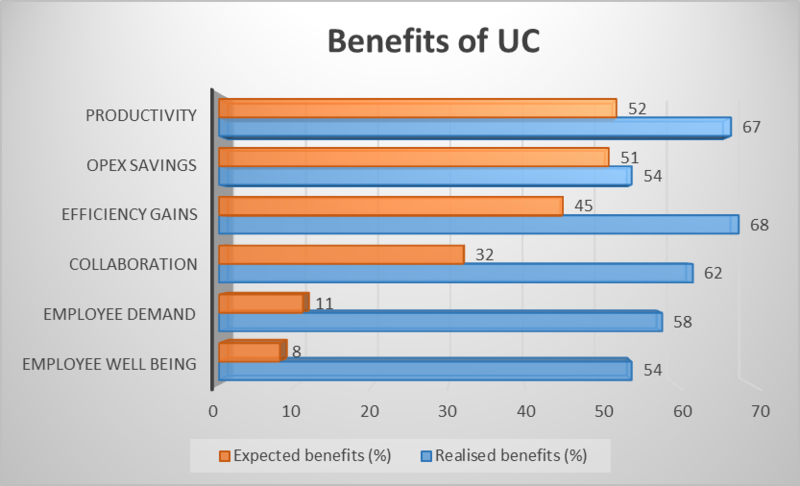 They found that management was focused, quite understandably on how UC technology would make the organisation successful and improve bottom-lines such as productivity, costs and efficiency savings. But what they’d overlooked was the more intangible, ‘softer’ benefits such as the ability to improve the workplace environment and to empower employees. If you look at the table below from PwC, it’s clear there’s disconnect between how they ‘expected’ to benefit from UC and the actual ‘realised’ benefits they received. Across the board the realised benefits exceeded expectations. But while you’d expect productivity, efficiency and even collaboration gains from UC deployments, the really interesting bit was how the deployments impacted employee perceptions of well-being. Often management make assumptions that employees are armed with the right equipment or that the tools are “good enough” to work with, so are reluctant to rock the boat to invest in new technology. 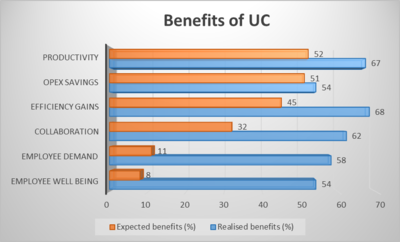 PwC saw that a UC deployment achieved a whopping 54% uplift in employee well-being. That clearly highlights that employee’s value being given technology that make their jobs and collaboration easier. For me the big worry was the marked difference between the 8% well-being benefit that management expected and the realised 54%. This shows how out-of-touch management really are with how employees feel about their jobs and their desire to perform to the best of their ability. It would seem our senior management need to be more cognisant of their employee’s need for ‘the right tools for the job’, and how it can affect creating the contented, happy and productive employees’ they crave. Technology is flourishing across Britain – not just in the Silicon roundabout. Tech City UK’s Tech Nation report recently found that a full three quarters of digital companies across the country are based outside of London. This is supported by our own Tech Cities Jobs Watch report where we noted a 10% drop in Q2 for IT roles advertised in London, compared to a 3% increase in other UK cities. These numbers represent a small part of the larger story of an expanding ecosystem of tech roles and innovation beyond the conventional hotspots. London’s position as a dominant hub for innovative digital businesses and tech-start-ups is unlikely to change any time soon – but a number of factors are creating a larger pull to establish clusters of tech expertise across the country. Below, we’ll look at a few of the forces that are encouraging the growth of digital Britain, and how it’s affecting the way businesses everywhere hire and operate. One of the major forces in the digitalisation of Britain is the rapid rise in both the number and variety of roles available outside the Capital. In one sense, this is an inevitable by-product of the way technology has become part of all aspects of our lives. Nearly all businesses in the UK are dependent on technology to operate, meaning a demand for IT skills for operations, sales and security is pressing. Big Data provides an example where the number of roles advertised in Tech Cities outside of the Capital increased by 18% since the start of the year. Echoing this trend, Mobile Development and Cloud roles increased by six and 13% respectively. As businesses large and small adopt more digital practices, the subsequent demand for IT professionals with skills in key tech disciplines will continue to rise. Cost is another factor affecting the increase in the number of jobs available in alternative tech cities. As tech infrastructure across the country has improved, it has become even easier for businesses to operate and work with teams in remote locations. Cost-conscious businesses are taking note of the potential benefits of moving functions away from London where they can operate more affordably, while also appealing to IT professionals who are seeking a different quality of life than they can get in the Capital. With more and more organisations across the UK battling to attract tech professionals, advertised salaries have been shifting to reflect the competition. London’s average salary for permanent roles, covered by our report, has remained the highest in the UK. They rose in Q2 2015 to £53,107 – roughly 3% higher than the average in Q4 2014. However, cities outside the Capital have kept pace: Cambridge, one of the largest UK hubs of digital business and innovation, and Bristol another of the UK’s longstanding tech clusters, both saw salaries increase over the averages recorded at the end of 2014, by 3% and 2.5% respectively. At the halfway point, 2015 figures from Tech Cities Job Watch indicated upwards pressure on permanent salaries across the country. Contract roles often present an opportunity for companies to bring in talent for short term projects, or to fill a gap while a more permanent solution is offered. It is also a chance for companies outside of the Capital facing skills shortages to entice specialist expertise from further away. Big Data roles have consistently commanded the highest average day rates, and in Q2 2015 Brighton and Birmingham were offering average day rates of £675, 26% higher than the London average. As we continue to monitor the hiring trends that evolve and Britain proceeds with its digital evolution, we can expect to see organisations increasingly recognise the need for talent that has been developed in cities such as London and Manchester, and to continue to stump up the necessary cash to attract them. Technology continues to evolve, and with it the demands and expectation of customers and staff. The skills and languages needed to provide services are also growing. I’ve discussed above how skills in Big Data (Apache Hadoop, Splice Machine, Tableau and SAP HANA) and Cloud development (Microsoft Azure, Amazon Web Services and MS Office365) have become more sought after by firms outside of big cities. We can only expect this to continue as more businesses, large and small, use IT to augment a wider section of their work. The private sector organisations across the country also face competition for skills from the public sector – which is undergoing major digital transformations, subsequently requiring large numbers of skilled IT talent. Other, more sinister forces are also having an effect on the demand for IT skills. In the wake of high profile cyber security breaches and attacks, businesses of all sizes are having to invest heavily in IT security. This is driving increased demand for SIEM (Systems Intrusion and Event Management) and IDAM (Identity Access Management) experts and biometrics specialists. As long as technology marches forward at its current breakneck pace, so will the hiring trends shaping the evolution of digital Britain. This guest post from Steve Gandy, CEO of MeetingZone, describes how businesses were hit by loss of working hours during the tube strikes due to lack of flexibility. Anyone of London‘s 4 million commuters who struggled into work during the recent meltdown of the UK Underground system will understand only too well the chaos the tube strikes caused to travellers and other transport links. Our recent survey has revealed there’s also been a huge cost to London businesses too. Those London strikes were part of an ongoing dispute with the Unions (which represent Tube employees), over plans to introduce 24-hour tube services at weekends. The launch of the 24-hour tube service has now been pushed back due to this, but not before the entire London Underground network came to a standstill on 8-9 July and 5-6 August 2015. The survey of 1000 London commuters, estimated that businesses lost a total of over 1.5 million working hours during the London tube strikes from employees being late into work. What‘s more, we calculated that London‘s commuters wasted an extra three million hours just getting to and from the office. These are staggering figures especially when you consider that much of it is really unnecessary. But this was made even worse by the fact the research also showed that only 9% of bosses let employees work from home during this time. 72% of employees feel bosses are still failing to offer flexible working options during travel disruptions. Sure, not everyone can work from home or remotely, but most office based jobs don‘t actually require people to sit at their desk. Technology like Unified Communications (UC) means that users can fire up a presentation, edit it with a colleague over IM or jump on a video chat instead – so it seems daft to ask employees to face travel hell. As I’ve mentioned before, part of the problem is cultural. Many managers and business owners aren’t opening their eyes to how technology could change the way people work and drive efficiencies. They’re happy to think ‘if they can‘t see them working they can‘t be working‘, which is of course nonsense. You can just as easily sit at your desk and do nothing. Even where companies do have access to UC technology, you see a lot of them assume a couple of training sessions mean staff are confident enough to use it when an unplanned event occurs. They aren‘t. What‘s required is a culture of adoption driven by senior managers who embrace the technology and lead the way, not only offering continuous training but also through post roll-out support. I feel sorry for all the commuters that had to set their alarms early. Forget the trains running on time – UK business should run on time too. The lost hours during the recent London tube strikes should be the turning point for companies to start thinking about flexible working options to reduce the amount time commuters waste. This is a guest blog from Richard Pedley, software engineer, Delcam, part of Autodesk. The CBI recently highlighted that the UK manufacturing industry is experiencing a crisis. In the UK we are lacking the vital skills to increase our productivity. In particular, the STEM skills gap has been an issue for many years and STEM teaching needs to be prioritised in the UK curriculum to encourage growth in this field. One of the main issues we have found is a general lack of awareness surrounding the broad range of opportunities STEM skills can offer after education. Raising awareness about the jobs available from a young age will help children aspire to pursuing a career they might not have considered or heard of before. There are a number of ways the manufacturing sector can get involved in helping to address the issue. At Delcam, we’re looking to address this by engaging with the Bloodhound and STEM Ambassador programmes. The programmes work to promote the engineering profession with a focus on the country’s young people by sending specially trained ambassadors to local schools. Delcam has been involved with the Bloodhound scheme for the past eighteen months and, at the start of July, three ambassadors visited Harborne Primary School to deliver a special school assembly for 270 students in Years 3 – 6, followed by an interactive Bloodhound activity session for Year 5 students. The way we search for jobs is constantly evolving and has historically been shaped by major technological developments. For example, in the nineteenth century the railways opened up new frontiers, driving candidates to out-of-town jobs. But recent history holds clues too; we don’t have to think back too far to a time when CVs were sent by post rather than email. With 97 per cent of UK millennials on Facebook and 500 million tweets sent globally every day, it is clear that the rise of social media is the latest catalyst for the next big change in the job hunting process. We check our mobile phones on average every 20 minutes and social media is ever increasingly important in our day-to-day lives, helping us stay in touch with old friends, telling us about breaking news, and even advising on the best local restaurant to choose. It’s only natural that recruiters are beginning to tap into the social media phenomena and recognise the benefit it can bring in matching the right candidates to the right job. Much like the typewriter brought us CVs, social media is having a big impact on the way we secure the best job opportunities. There is now a range of tools available to recruiters that utilise social media to help reach the most relevant candidates in a more personal way than has been previously possible. For example, at Monster we have recently introduced Social Job Ads, a technology that automatically targets relevant candidates via Twitter, distributing details of suitable jobs to candidates that are best matched to the role. Thanks to technology like this, the recruitment process is becoming much simpler for both recruiters and candidates. The hunt for the best job and the most suitable candidate has evolved so that we can now take a job opportunity and send it via social media to targeted recipients. It’s effectively working the crowdsourcing model in reverse. Rather than waiting for an individual to make a positive decision to join a crowd, social media helps recruiters identify both active and passive individuals who could be part of that crowd. Of course the idea isn’t to entirely automate the selection process, but rather to introduce efficiencies for the recruiter and help ensure passive candidates are aware of job opportunities available to them. Potential employers can share relevant and interesting vacancies in real-time, allowing users to receive the notification on-the-go and in a bite-size chunk rather than being overloaded with detail. By reaching out to a pool of passive candidates, technology of this kind allows recruiters to interact with those who otherwise may not consider a particular opportunity. This can be especially ground-breaking for sectors that are dominated by one particular type of candidate. For example, last year women accounted for less than a fifth of the UK’s IT workforce and yet there were over one million related jobs advertised. Making a wider range of suitable candidates aware of a job via social media may well form part of the solution to filling shortages such as these, avoiding talented individuals self-filtering or waiting for workers to decide to look for their next move. As online and offline lives continue to merge, and more and more candidates are sourced via social networks, it’s crucial that businesses identify how innovative social media technology can be and the positive impact it can have on their recruiting strategy. Making sure we’re harnessing the tools at our fingertips will help ensure we’re connecting the right people with the right jobs, wherever they may be. This is a guest blog by Ellie Stevenson, a student from Notre Dame High School in Scotland, who recently visited Silicon Valley after winning the Founders4Schools Appathon competition. Ellie and her team mates thought of the winning app idea Smart Wardrobe. Upon the day of flying to the West Coast, we were ecstatic. We knew that no one in our school, area or country could have such an amazing opportunity such as this. After the long flight, we instantly felt the heat of the place and couldn’t wait to get to our hotel. We met the three of the Cambridge university students; Joseph, Ben and Patrick. Evgeny was due to meet us on the last day as he had end of year examinations. We also met Iria, our host from Founders4School. Having a reunion since the November awards giving was great and a chance to get to not only experience the sheer brilliance we were about to see but also get to know our university students better. Waking up with the full effects of jetlag, we went to our first company, Square. It was very impressive as a start-up and its main objective was to keep up to date with payment methods with the square product. They offered a Coding Camp for girls to learn how to code which is a vital skill in the tech world which we found very helpful. With only visiting one of the many companies in Silicon Valley, I already realised how much companies value innovation and constantly changing their product to better suit the people using them. One of the things that struck me as being very impressive was the framed bits of scribbly scrap paper with their original ideas of Square. They took great pride in showing the idea and initial prototypes which changed into the great company that they have today. It isn’t just a rumour; companies love innovation and take great pride in it. They describe themselves as the ‘hacking company’ and not in the way you would think. Hacking to the Facebook community is really just taking apart what you have and seeing it as a way to improve what you already have. Full of inspiring people, Facebook was everything you would think it was and then a bit more. There were so many employees. And they were all so happy with the company and you could tell how much they loved working there. All of the employees talked of ‘Mark’ as a friend compared to one of their bosses. Arriving to Tesla was a different experience entirely. Straight away we realised the sheer size of the factory and the many charging stations they had in the car park. We were shown a white Model S car and how it charged. Right down to a single battery cell we were shown the metal under body to the full car’s completion. Going around on a red buggy, we were shown each stage and the impressive robots that only help with 10% of the production line as a whole but were of great convenience to the company. We actually got to see them in action making a car right in front of us which was amazing. Waking up on the Wednesday was quite a challenge as we had decided to get up before sunrise and hike up the Stanford Dish Trail and see the sunrise. Ironically, it rained that day when California had been having one of the worst droughts spanning two years. We all laughed and claimed we had brung the rain from Scotland to San Francisco. The hike was beautiful yet tiring so we were relived to get back into the car and drive to LinkedIn. I was very surprised at how much I enjoyed LinkedIn. Aaron showed us around their offices which was literally surrounded by Google buildings as they shared the same complex. They also had an arcade and a huge catering facility and had the same cool workplace vibe. We talked to a panel of employees, with 4 of them only being there for 2 weeks on their summer internship programme. I was impressed of how much knowledge they had of the company and where it was heading having only had 2 weeks of experience. They came from very different backgrounds and college or university degrees yet all shared the same passion to improve their product. One of the best things about Silicon Valley is that they value each member of their team to help with the overall product with not a lot of experience which was awesome for the internship programme. Interestingly, many people in Silicon Valley switch from job to job. Staying at LinkedIn for two years was considered to be a long term role, whereas in Britain many people stay in the same post in their workplace until they retire. Finally, we went to Google. They had the famous bikes to ride from campus to campus as their workplace really was that big. They had an 8 man bike which one person would steer and seven would pedal and as our employee, Hai Hong, who showed us around called it the conference bike. It was funny to think of a conference were one person had all the power to steer them wherever they wished to go. The employees were all so happy in the sense they were really happy to help with anything and were all so caring and also loved there work environment. The place was amazing with the people in it and I really understood how Google was such a huge success in not only being a powerful search engine but a huge community in Silicon Valley and certainly beyond. We finally realised how quick the visit was drawing to a close and how we had to indure the flight home. PayPal was a nice environment to be in where they answered all the questions they had and explained what their tech company was really all about. They too had an amazing internship programme with many opportunities’ to travel globally. They had a clear vision to help payment become simpler for everyone. Our final place to visit was Edmodo, an amazing education start-up which helped teachers, parents and pupils alike to connect after school and to further enhance their learning experience. The employees all really have a passion for education and to help where they can. It was very emotional to say goodbye to Iria and the university students who we grew close to during the trip. I have took so much from this and i would like to thank Silicon Valley comes to the UK for it. After seeing everything I really want to come back and work there for good as it is so amazing and something I am very interested in. I will remember this experience forever. Today, education and teaching methods are on a transformative path. Schools, colleges, universities and other educational institutions are endeavouring to keep up with digital and technological advances and what their learners – largely digital natives – demand. A lot has changed since chalk and blackboard were the only means of communication. Today learners expect to work from PCs, laptops and tablets daily for their lessons and research as well as for homework. The challenge of creating and sustaining engaging learning material is faced by teachers every day; a task that is being made easier by using Interactive White Boards, up-to-date printing facilities and collaborative file sharing. Meanwhile in the background Managed Services can streamline administrative processes and reduce costs. Interactive whiteboards combine advanced high definition displays with multi-touch screen technology and wireless connectivity to other devices. They help to create highly stimulating lessons and present engaging visual information that brings learning to life. The immersive learning experience is more collaborative and enables teachers to create and deliver compelling interactive material to enhance understanding of the topic, optimising engagement and stimulating their students. Making the whiteboards as intuitive to use as the blackboard allows teachers to focus on their teaching, not the technology. With increased access to digital technologies, schools are also implementing Managed Print solutions for quicker, more convenient printing from PCs, interactive whiteboards, and mobile devices. Print demand in education remains strong – with classroom handouts, test papers, homework, essays, research… a Managed Print Service (MPS) can help both save paper for the school and offer secure and convenient Printing for students. The new digital age of education means that documents can be printed when and where they are needed but still give administrative staff clear visibility into printing usage and costs. Features such as scanning and storing can also reduce unnecessary printing. Having logged on, students and staff can use the MFPs to scan learning materials and documents to email or save them to a USB drive, saving print costs and paper. The implementation of the MFPs has also reduced the administrative burden, for example, a simple one-touch interface supports scanning to SIMS (Schools Information Management System), enabling paper-based records to be captured and recorded digitally. Schools like Leeds West Academy, investing in technologies to modernise processes and future-proof learning environments, are benefitting from reduced costs and administrative loads as well as more effective management of student records and governance. More importantly, students are enjoying a more engaging, interactive and collaborative learning environment where their familiar digital technologies are now at the heart of their educational experiences.